The Quebrada de Humahuaca is a mountain valley that has been in use as a cultural route between the Andean highlands and the plains for over 11000 years. The valley, carved out by the Rio Grande, is ca. 150 km. long. The river is dry in winter but flows copiously through the Quebrada in the summer. Numerous tracks, roads and settlements testify to the civilizations that once lived here: hunter-gatherers, indigenous Omaguacas, Inca, Spanish and the Argentine Republic. Due to its strategic position it has been colonized by both the Inca and the Spanish, who were after the trade, minerals and agricultural products. It also has been a stage for many battles of the Argentine War of Independence. So this is the first review of the Quebrada de Humahuaca. Quite remarkable, as it is well on the beaten track for both overland South America travellers (it's close to the Bolivian-Argentine border) and regular Argentinian holidaymakers. Think of a sanitized version of the Andes, in a Colorado/Arizona landscape. I stayed here for four days, both in Purmamarca and Tilcara, and drove up and down the valley in a rental car. 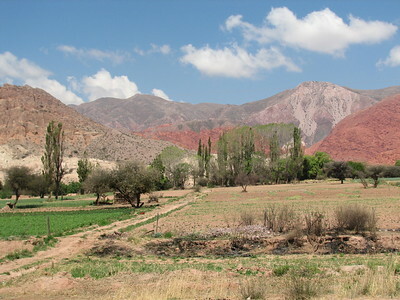 The Quebrada has a relatively high population density, in which it differs from the many other valleys around Salta. The town of Purmamarca (population: 360) is quiet though: earthen roads, low adobe buildings, the smell of wood smoke in the streets in the evening and early morning, scarce street lighting. It's a great little town to stay in. Its major landmark is the Seven Coloured Hill, where the town is exactly located in front of. The natural scenery is one of the major assets of the Quebrada de Humahuaca in general. It wasn't put on the World Heritage List for its natural beauty however. It's a 'cultural route', used by everyone from hunter-gatherers to independent Argentina. The tracks of the early groups aren't very easy to spot for the casual visitor. Most of what is visibly left dates from the Spanish colonial times and later. Driving north, the first historical building you encounter is the Posta de Hornillos. This is a 16th century post for travellers to rest, modelled after the oriental karavanserais. It is now turned into a museum about the history of travel along these roads. Next is the very white Capilla de San Francisco de Paula, in the town of Uquia. It has a large golden altar and was constructed in the mudejar style that so often is seen here. Even more north is Humahuaca. This is a relatively large town now catering mostly to backpackers on a stopover. One can almost feel the Bolivian atmosphere here in the streets, it's that far north. Humahuaca is home to the lovely ruin of the Torre de Santa Barbara (once a fort, now moved), and an enormous Heroes of the Independence Monument that dwarves everything else in town. Like I already wrote, the pre-Hispanic sites are more difficult to find. I found that I had to make an effort and braved a visit to Coctaca on my own. Coctaca is mentioned as one of the very few specific places in the nomination files. It supposedly has spectacular terraced agricultural lands that show all about how farming locally was and is done. The only thing I noticed however was an extremely difficult unpaved road to drive, lots of cactuses and a town that seemed uninhabited. There were some stone demarcations visible between the fields, but I didn't really get where to look at. You should really hire a local guide to visit here. A more spiced up pre-Hispanic remain is the Pucará of Tilcara. A Pucará was a fortified village, in which the inhabitants defended themselves against the many invaders (and neighbours). The one at Tilcara is almost completely restored. This didn't make ICOMOS happy, but I enjoyed my visit a lot. The Quebrada de Humahuaca (as most of the cultural landscapes on the list) lacks major sights and I'm glad that Tilcara at least made an effort to make its precolumbian history come alive. The houses and communal buildings were made of dry stone. The relatively large settlement, on top of a hill, is largely complete. There are explanatory signs in Spanish and English too. This was the first site I visited outside of Europe and the Middle East. It was a lucky choice since the area has a very distinct atmposphere from what I had knewn. The Quebrada is stunning in its natural setting and a very special place. In the Quebrada we visited Tilcara (where we stayed and I would recommend to stay) and nearby Purmamarca. Two special assets of the towns are their traditional colourful cemeteries filled with joyful floral ornaments which are surprisingly cheerful and the local Cuzco style paintings. If you want an interesting explanation about the Quechua influence on this local Baroque style (in Spanish) go to the Museum of Colonial Painting in Jujuy Capital. Local restaurants offer traditional Andean food and in some of them you can also listen to indigenous music. Two nearby attractions I would recommend to visit while here are are the Salinas Grandes de Jujuy (second largest salt flats in the world after Uyuni, Bolivia) and Calilegua National Park. Pictographs: "pictographs in black, white and red"
Pyramids: At the Pucara in Tilcara: ... stands a monument resembling a pyramid with a truncated top. It is a tribute to archeologists Juan D. Ambrosetti, Salvador Debenedetti and Eric Boman, and it was built by architect Mart?n Noel in 1935. Destroyed during invasion: The Pucara at Tilcara was destroyed by the Spaniards and its inhabitants exiled. Destroyed or damaged by Earthquake: Church of Tumbaya was destroyed in 1796. Ateliers: The Argentinian painter Jos? Antonio Terry had his atelier in Tilcara. In his works he described the Quechua natives and the coulorful mountains. His atelier now serves as a museum.